I am not being udderly foolish, there really is a National Cow Appreciation Day! Some celebrate it the second Friday in July, others celebrate it on the 14th or 15th. 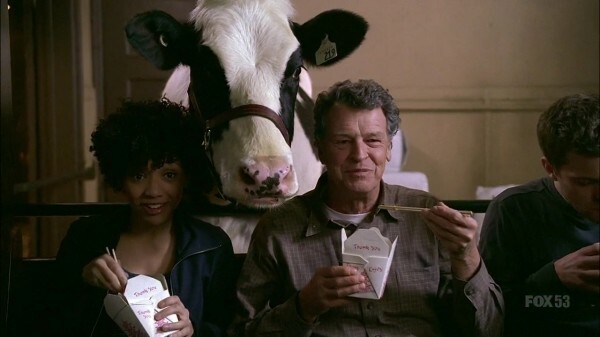 Since one national fast food restaurant chain is celebrating it today(http://www.cowappreciationday.com/), I thought we here at Fringe Television should shower our favorite bovine, Walter Bishop's cow, Gene, with some lovin'. So leave your comments below on why you love Gene. I'm sure she'll be mooooved by all of them! I udderly luv Gene. She's just soooo beautiful. Im am ever so thankful she is not the Jersey breed of cow......she may have ended up on Jersey Shore! Oh that would have been painful! Whoo go Gene! She is the best cow on television! She needs some more screen time in season 4! Love ya, girl! I wonder if other livestock think of Gene as a super-model. She could be National Spokes-cow for this appreciation day. Or she could be a super-model on any number of occasions. Like all world class models she has: clear, beautiful eyes. a lean, trim posture. firm, natural teats, high up on the udder, and she has star/camera appeal. Of course, like any super-model she has her issues. She has a world class pharmacist on call 24/7. She has a eating disorder and is a slave to Chinese food binges. And she can get real mooooo-dy. Her private life is one for the tabloids too. The question was raised that she conceived her calf out of wedlock, and that the bull she is with now is not the original sire. Rumor also has it that she is not just about the boys. It was reported (leaked) that she was caught chewing another cow's cud, and that there may have been some udder play. Gene is quite a showoff too. Those paparazzi photos where we see Gene backing out of her limo-trailer and we see way too much of her "girl business" was not an accident... Gene's publicist planned that. Anyway. Gene as a celebrity - fine. Gene as a role model - no. But secretly, all bulls want to be with her and all cows want to be her. I don't love Gene. I DON'T TRUST HER! Isn't she supposed to be Arvin Sloane's henchcow or something? If Gene receives too much love, then it'll just come to fruition that both she and Rambaldi are behind the Observers. Gene is the Key to the universe. Gene is such a smart cow!! Plus, she also has the best come-back lines (Hear her moo every time someone visiting the Lab says: "Is that a cow?" Smart, pretty and sassy...That's our Gene!! I love Gene The Cow!! She's the apple to my eye! You make my day whether it's from your smile or your morning milk! Oh! Gene...Oh! Gene... I love you!! And don't forget, it's remotely possible our Gene might be housing our William Bell! Did anyone see which way he went when he left our Liv's body? Ha - Gene as a celebrity whore. that's funni. what is her maiden name .. Gene Kardashian? as a person who grew up on a farm i am going to celebrate it, nice. One more excuse to gather all my friends together.